Consistent genetic and epigenetic regulation is required to sustain the complex homeostasis that is life, and it seems that a degree of this regulation continues into death. Recent post-mortem studies have identified a subset of genes that appear to come alive hours and days after organismal death; these so-called “zombie genes” have been implicated in a vast array of central cellular processes. The purpose of their activation after death remains cryptic, and whether this suite of genes is relevant for the living is not known. What our research team set out to explore was: when animals are pushed to their elastic limits, does gene expression mimic a zombie-like expression profile? Coming from a lab that works on extreme animal survival strategies and adaptations such as metabolic rate depression that is used to overcome harsh environmental conditions, one question immediately popped into our mind after reading Pozhitkov and colleagues’ work, “Tracing the dynamics of gene transcripts after organismal death.” Our question, that could only be answered through rigorous scientific experimentation, was centered on exploring the relationship between death and a near-death situation in a living biological system, i.e. mammalian hibernation. More specifically, our curiosity-driven hypothesis was that hibernation, which represents the closest living and natural mammalian phenomenon to death, would display a gene expression profile that is similar to the profile of zombie genes activated after death. 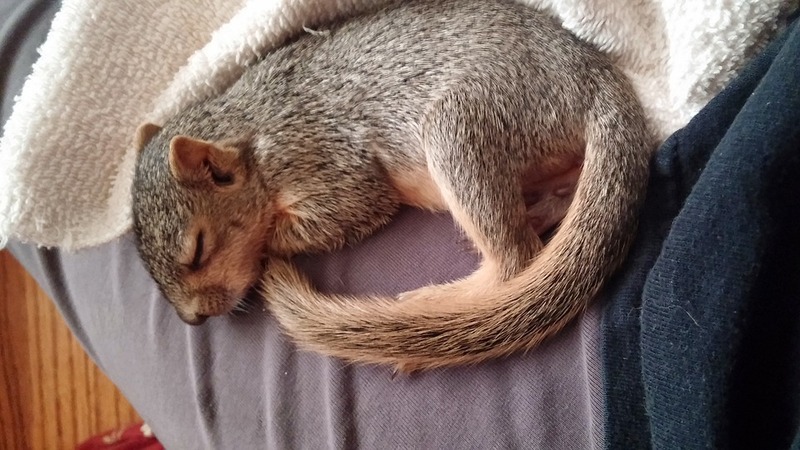 Hibernation is an extreme winter survival strategy in which small mammals sink into deep torpor by reducing their metabolic rate and dropping body temperature. Indeed, the definition of hibernation is quite like that of death, with two main differences. Firstly, hibernation involves the extreme suppression, but not complete stoppage, of vital body functions, wherein the metabolic rate can fall by more than 90% compared to resting rates. Secondly, hibernation is reversible, whereas death is the unequivocal end of life. With these integral pieces of the puzzle in mind, we set out to investigate the regulation of “zombie genes” in a living, yet metabolically arrested biological system. To test our hypothesis, we designed a suite of experiments to examine the gene expression of a set of 45 representative zombie genes in multiple tissues (liver, brain cortex, hypothalamus, heart, muscle, bone marrow, and brown adipose tissue) during deep torpor in thirteen-lined ground squirrels (Ictidomys tridecemlineatus) and comparing our findings to euthermic (active) squirrels. Representative “zombie genes” were selected to have coverage of the major functional categories that were observed following death including; stress-responsive processes such as immunity, inflammation, apoptosis, as well as development, transport, cancer, and epigenetic mechanisms. Zombie gene transcript levels were quantified in the liver using qRT-PCR and available transcriptomic data repositories were mined to examine zombie gene regulation in the remaining tissues. Perhaps unsurprisingly, our results showed that hibernation and post-mortem gene expression profiles were NOT similar, or, in other words: Hibernators are not zombies. But what does it mean to say that hibernators are not zombies? From a biological perspective, our study showcases the extent to which hibernators profoundly shut down gene transcription, surviving only on the transcripts critical for survival and do not require zombie genes that could correspond to the cell’s last resort in extremely stressful environments. 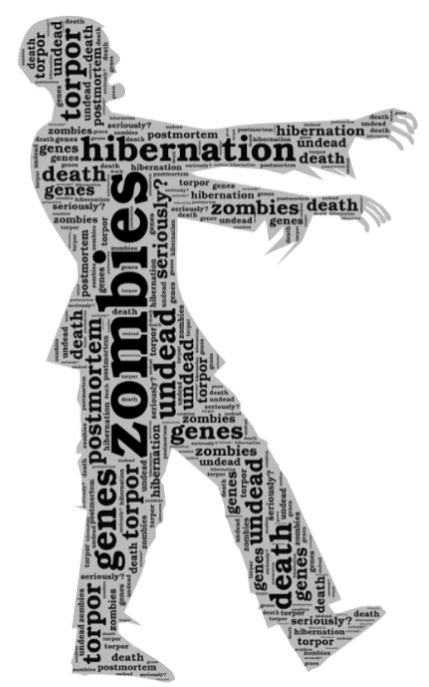 To better understand what this might mean for hibernators and the living, it might be useful to bring to light the top three current theories that attempt to explain the purpose of zombie genes. Upon death, cells that are still alive experience microenvironment stresses and energy imbalances that require the activation of pro-survival pathways;  that the decay of repressors and tight chromatin packaging results in the activation of genes that are typically repressed (i.e. after organismal development); and/or  the fact that organismal death does not result in the instantaneous shutdown of all cells. With these theories in mind, the fact that hibernation can be considered to be more tightly regulated than death and similarly does not resemble death in a transcriptional manner makes sense. In summary, despite a zombie-like phenotype that hibernators display while in deep torpor, their genes are anything but dead. To our knowledge, this is the first study to explore the responses of zombie genes to a near-death situation, and we hope it is not the last. These findings are described in the article entitled Genes of the undead: Hibernation and death display different gene profiles, recently published in FEBS Letters. This work was conducted by Hanane Hadj-Moussa, Alexander J. Watts, and Kenneth B. Storey (Storey Lab website) from Carleton University, Canada. 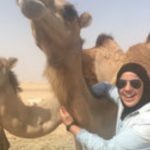 Hanane Hadj-Moussa is a PhD student in Dr. Kenneth B. Storey's Lab at Carleton University.